Let’s say you’re like me, and when you pick up a new book one of the first things you do is to prowl around in the index. 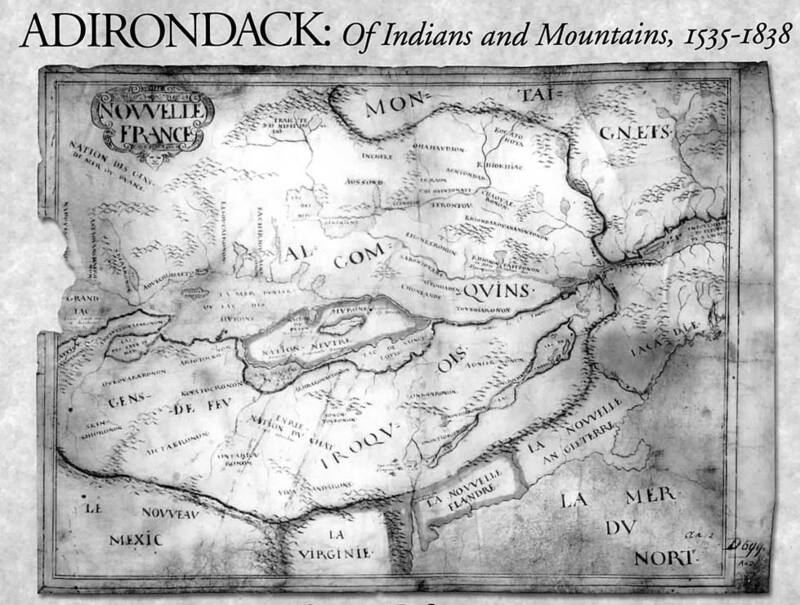 Try that with Stephen Sulavik’s new volume Adirondack: Of Indians and Mountains, 1535-1838, co-published this spring by Purple Mountain Press and the Adirondack Museum, and you will stumble across tongue-twisters like Achkokx, annienerouonon, Aticq and atirú:taks. And that’s just in the A’s. You will quickly realize that this is a work not be taken lightly. Indeed, Sulavik (a doctor who teaches at the Yale University School of Medicine) has put together a compelling compendium of his long and meticulous investigation, much of it based on contemporary accounts and many never-before-published maps, into how the Adirondacks got their name— and not just what that word means, but how it came to be. Get to know this book better, and you can’t help but learn a lot, not just about where the region’s name came from, but also about early mapping of the area and the often-astonished observations of some of the first Europeans to come in contact with this land and its inhabitants. My initial research interest in these mountains had to do with the unsurpassed Adirondack guideboat, which I believe represents the Adirondacks’ proudest legacy. In the course of reviewing a wealth of material, in hopes of finding new information pertaining to the guideboat, I realized there was virtually no well-documented, valid primary source information pertaining to the historical origins of the name ‘Adirondack.’The relative historical importance of this subject changed the direction of my work to what I thought might result in a small paper. As I found more relevant information than I had originally thought I would, a small monograph became a possibility. I was fortunate, having access to one of the world’s finest libraries at Yale University, to come across more and more material pertaining to the name ‘Adirondack’—and so a book. 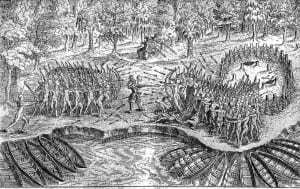 when he and his Algonquin allies fought a Mohawk band near Crown Point. Very well. Let’s take a closer look at the last and most pronounceable of those index entries noted above: atirú:taks. Sulavik explains that the diacritical mark accents the syllable under it, and that the colon assigns a long sound to the preceding vowel. Sound like something you’re a little more familiar with today? He confirms that “it is generally accepted” that it is a Mohawk word for “tree eaters,” although whether that will ever be proven conclusively remains to be seen—and, to his credit, he notes other plausible meanings, such as the possibility that it was a Huron term for “the rock clan.” He also demonstrates how it is in fact the progenitor of Adirondacks, likely applied as early as the 1570s. Achkokx, although it looks more like the name of a flying dinosaur, is another etymologic forebear, dating from 1627. In a back-of-the-book table, Sulavik offers up some 40 of these, wending from those first two through eight different renditions of Rondaxe (a name seen on regional maps even today; look in the Old Forge/Inlet area), Oroonducks (this one sounds like a cartoon character), Arundax, Raarondacks, and finally wrapping up with Ebenezer Emmons’s Adirondacks, the name he proclaimed in 1838 and the one that stuck (possibly because nobody could pronounce any of the alternatives). The cluster of mountains in the neighborhood of the Upper Hudson and Ausable rivers, I proposed to call the Adirondack Group, a name by which a well known tribe of Indians who once hunted here may be commemorated. 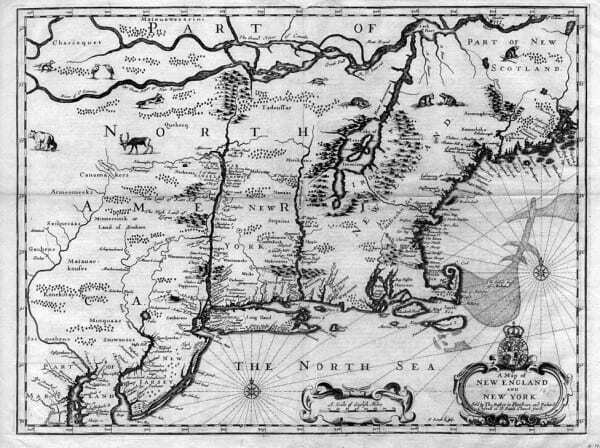 It is well known that the Adirondacks resided in and occupied a part of this northern section of the State, and undoubtedly used a portion, at least, of the territory thus bounded as their beaver hunting grounds. This name is not so smooth as Aganuschioni, which has been also proposed as a name for the group, but the above historical fact has induced me to propose the one given above. He goes on to explain that the people called Adirondacks were an indigenous band who occupied the lower Ottawa River Valley (this river forms the border between Quebec and Ontario for a considerable distance before emptying into the St. Lawrence just above Montreal). Part of the Algonquin nation, they were also known in Algonquin as the Ounountchatarounongak and the Ouaouechkairini, among other appellations, and in Huron-Iroquoian as the Khionontatetonons and several others. (I point this out so you will stop complaining about having to say “atirú:taks” and “Achkokx” and so you will realize how lucky we are that we do not have to tell our friends we are going hiking in the Ounountchatarounongaks, or applying for a permit from the Khionontatetonon Park Agency.) There follows a captivating and detailed account of the “Adirondack Indians,” including their relationship to the Iroquois and Algonquins. Now, if you’re a map aficionado, this is a book for you, regardless of whether you care a hoot who thought up the name Adirondacks or through what etymologic acrobatics it morphed. In fact, this book could as easily be marketed as a study of early cartography as anything else. Sulavik bases much of his narrative on close study (his own and others’) of numerous period maps, many of which are reproduced in the book. Through studying these reproductions, one bit of knowledge you will acquire is that the first Europeangenerated name for the region was the relatively mellifluous Avacal, whose derivation, Sulavik confesses, is unclear. Also unclear is exactly, or even approximately, where Avacal was. There was in fact considerable liberalism about this; in some instances the term was plastered all over what now spans the several hundred miles from east-central Ontario to northern New Hampshire, in a time when some maps put Lake Champlain well to the east of the Connecticut River, an error that hung around for a good two centuries. Another locates it about where Tennessee is now, showing also a river running from there into the St. Lawrence, which does not originate in the Great Lakes but rather in the confluence of two fictional tributaries. appears east of the Connecticut River. A closer and perhaps more forgiving perusal of these maps, however, makes you realize that our pioneer cartographers were pretty darn good, given that they didn’t have airplanes and aerial photos, well-maintained trails with disks to guide them to high points, or GPS contraptions bouncing electrons off of satellites, or whatever those things do. OK, you’ll see the Mohawk River running parallel to Lake Champlain on one, but give them a break—they were trying to figure out a whole new (to them) continent while standing on it, probably in thick forest, or on the deck of a ship just offshore, from where they could see little but that same thick forest most of the time. It’s no wonder it took them generations to get Lake Champlain situated—and shaped—more or less correctly. No matter; these maps tell their own exciting story of how Europeans apprehended this vast land and how their perceptions of it matured. The maps are the artistic part of this book, whose central section presents some 32 of them, chronologically from 1565 to 2000, although all but two of them predate the watershed year 1838. That’s all right, because the maps from those times are more fun to look at anyway. The earliest ones have lots of “Parte Incognita” beginning just a few miles inland from the Atlantic coast, but as we progress through time, the territory of cognition increases rapidly. Champlain’s maps of 1612, 1613 and 1632 show increasing sophistication, including the placement of more and more native names, thus providing visual support for the etymology Sulavik narrates. Many of the maps are illustrated, as was the style of the times, with fantastical creatures, not the least impressive of which are sea monsters. Many were also illuminated with drawings of native peoples and plants, their veracity open to further scholarly inquiry. The fourth and final part of this eclectic assemblage deals with early contacts between Europeans and indigenous peoples in the Europeans’ own words. Some of this is not for the faint of heart. We have Jacques Cartier, generally considered the first European to see the Adirondacks, describing in clinical if quaint detail an outbreak of scurvy in 1535. A Jesuit recounts the Huron practice of burning oneself “for the pleasure of it,” although this act may have had a ritual purpose that he did not grasp (actually, as can be sensed in a close reading of this and similar passages, there was a discouraging lot about the indigenous peoples that the Jesuits and their fellow missionaries did not grasp, to their later regret). 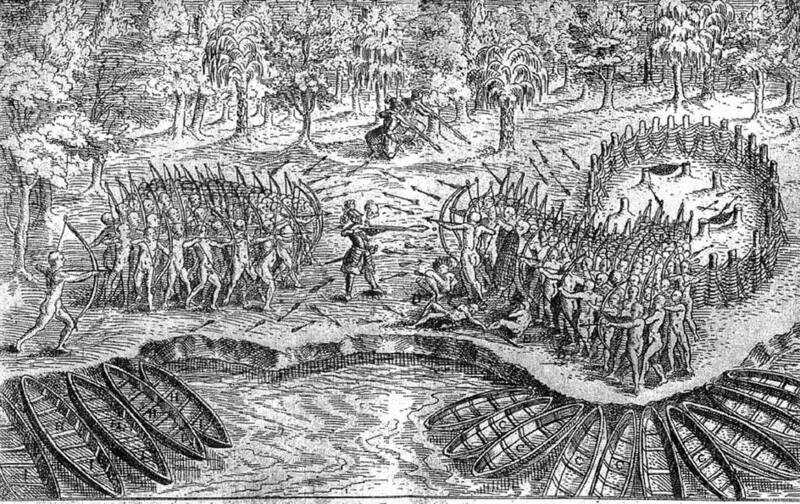 We read about an ill-advised 1666 raid by a French army against a Mohawk settlement, which necessitated a month-long march; unfortunately, the month they chose was January, resulting in various body parts freezing. This account also rather humorously describes the soldiers’ misadventures with “raquettes,” or snowshoes, whence comes the name of one of the principal rivers of the Adirondacks. Also here are wonderful, detailed narratives of native ways before they were corrupted by the Europeans. Adirondack: Of Indians and Mountains is an illuminating excursion into a dimly known era, and I hope you find the journey as adventurous as I did. Meanwhile, I’m going out to buy a new computer. My spellchecker just came up against Ounountchatarounongak and went up in smoke.